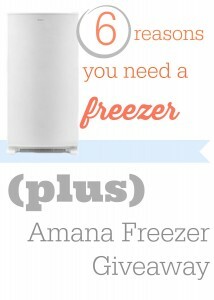 Home > Free > 6 Ways An Extra Freezer Saves You Money + Amana Freezer Giveaway! 6 Ways An Extra Freezer Saves You Money + Amana Freezer Giveaway! I’m not normally the kinda person that says you need to go out and buy something, but there is one appliance that I think should be added to the list of “normal” household appliances. We should all have an extra freezer. While I’m not saying you need to go buy a monster freezer that costs $1K, I am saying that any extra space you can get is going to pay for itself in the amount you can store and stock up on. For any naysayers, lets take this in a cost vs. savings breakdown. First the costs… a typical 7 cu. ft. chest freezer (tiny but better than nothing) will be $169 to $199 on sale. The monthly cost to run this guy — $2. Let’s say you decide to splurge to save yourself some sanity in the long run and get a stand up freezer (my personal favorite because you don’t lose things into the abyss of a chest freezer). A 14 cu. ft. upright freezer will run $389-$499 and will cost $4 per month to run. Savings wise you need to save the cost of the freezer plus the measly monthly cost to run it. I think you could do that just with one or two meat sales and a run to the farmers market! Produce is crazy expensive outside of it’s normal season, but that doesn’t mean that you don’t want it. Right now in my store Strawberries are $4.99 a lb, which is insane. However, with your trusty freezer you could head to the farmers market in peak Strawberry Season (March here) and get them for $1 a lb! Wash them, cut the tops off and freeze them for all the smoothies and strawberry shortcake you want for the rest of the year. We love our farmers market and grab corn on the cob by the half bushel, okra, fruit, and a lot more. Pretty much everything can be frozen and stored, just google how to freeze and the vegetable to get the details on what you need to do to them. We try to make monthly trips to the market for what’s in season and I would estimate that our trips each month save us easily $100 versus buying the grocery price (the farmer’s market always beats the grocery price even in season). This is the #1 way to save on meat. Meat in the grocery store will hit occasional good prices, but will never touch the price of bulk meat. My new favorite store is the US Foods Chef store, I ran into ours yesterday and saw that chicken is $1.89 lb and ground beef is $2.86 lb and lot of other great prices on other types/cuts of meat. I can’t tell you the last time chicken was that price in the grocery store. Currently it’s $3.99 lb “on sale” at Publix. So you’re saving $2.10 a lb to buy in bulk. It’s a 40 lb box, so that’s a lot of chicken… but it will last up to year depending on how you freeze it (vacuum sealing vs. ziploc). Our 40 lb box will last us about 3 months. One other option is buying a half or quarter cow. Head to a local farmer or butcher and they will give you all the details, but this gives you a flat price for the meat no matter the cuts you get. We choose roasts and steaks mostly and pay on average $3.15 lb flat. That’s an insane savings for steaks over the grocery store price! Your little old fridge freezer won’t be able to hold this though… you gotta have an extra freezer. A quarter cow will be about 150-175 lbs of meat! Since most of us are couponers around here, this one is a no brainer. You walk in and realize that you can get Ben & Jerry’s Ice Cream for half price and you’ve got coupons… the fridge freezer might take 3 pints, but a stand up freezer… This is one silly example but you get the idea. We have extra pizzas, bagels, pancakes, and even baked goods stored up that cost next to nothing to grab. You can actually freeze a lot of things you may not think of, milk, eggs, cheese, butter. So no need for an extra fridge – just an extra freezer. How much you save here is really up to your mad shopping skills, but since we save over $4000 a year using coupons, I would safely guess that at least one quarter of that is on frozen items that we are able to store by having extra space. When you head to the grocery store, pick up extra and maybe make two of what you’re planning on cooking for dinner and freeze one. If you make two meals every time, you’ll be cutting your grocery trips in half which means you can save money on gas. If you drive to the grocery store 5 miles away, once every two weeks instead of once a week, you can save around $85. Our family enjoys eating out together. Once a week we go to the same Mexican restaurant out of tradition. If we go out anymore during the week, it’s just out of convenience. The average American eats out about 4 times a week. For a family of 4, that could be costing you $160 at $10 a plate. If you cut that back and use freezer dinners for 3 out of 4 of those times, you can save $6,240 a year. This one may seem a bit silly to you. If you think this is a measly savings, but you’ve covered the cost of the energy to run your freezer with this one! If you buy 10 bags of ice a year at $3/bag, you’re saving $30. Seriously though, freezing empty containers with water helps make it more energy efficient. An empty freezer is less efficient because there’s nothing there getting cold to help cool the freezer. Around here, we love Amana! They have awesome appliances from stoves to freezers sold almost anywhere you would buy your appliances. What I love most about Amana, they care about their customers! They’ve hosted some great giveaways on Southern Savers and today is no different. One Southern Savers Reader will win an Amana 20 cu. ft. Upright Freezer with Energy Star Rating (an $850 value!). Save money and energy: Saves you money over the lifetime of the appliance by using less energy to conserve resources. Free-O-Frost system: This Amana upright freezer prevents ice buildup, so you don’t have to worry about setting aside time to defrost the freezer. Deepfreeze technology: Deepfreeze technology delivers the ideal long-term storage for your frozen food. This technology cools the freezer down to an ice cold negative eight degrees to ensure everything from ice cream to meat stays frozen. Fill out the form below to be entered to win. If you don’t see the form, click through to enter. This giveaway is sponsored by Amana, but all opinions are 100% my own. The winner of this giveaway will be chosen 11/20.